Status: Fairly common regular spring and fall migrant east, uncommon east-central, rare casual west-central and west. Uncommon regular winter visitor southeast, rare casual elsewhere. Documentation: Specimens: iliaca?, UNSM ZM17887, 21 Oct 2000 Lincoln, Lancaster Co; zaboria? UNSM ZM18334, 7 Nov 2005 Dodge Co (see Taxonomy). Taxonomy: Some 15-24 subspecies are recognized by various authorities (Pyle 1997, Gill and Donsker 2017, Clements 2016, Weckstein et al 2002). These are generally divided into four subspecies groups (Pyle 1997), which were recently tentatively raised to species level by Gill and Donsker (2017): Sooty Fox Sparrow (P. unalaschcensis), Thick-billed Fox Sparrow (P. megarhyncha), Slate-colored Fox Sparrow (P. schistacea), and Red Fox Sparrow (P. iliaca). In accordance with AOS, as of 2018 we have not adopted this treatment. Of these groups, the first two are restricted to the coastal and western montane Pacific region, and interior montane Slate-colored Fox Sparrow is unlikely to occur in Nebraska (but see below). Red Fox Sparrow subspecies are zaboria, breeding from interior Alaska to central Alberta south to Northwest Territories and Manitoba, wintering from southern California to south Texas, north and east to Iowa and Georgia, and iliaca, breeding from northeast Manitoba and Ontario to Newfoundland, wintering from Michigan to Mississippi east to New Hampshire and Florida. All Nebraska observations since collection of a single example of schistacea 150 years ago (AOU 1957) are of Red Fox Sparrow; it has been assumed that subspecies P. p. iliaca and P. p. zaboria migrate through Nebraska (Bent 1968; Pyle 1997). All Red Fox Sparrows winter in the southeastern US, including zaboria, which breeds west into Alaska, and thus migrates southeast on the northern Great Plains; it is only a rare migrant in northeastern Colorado (Andrews and Righter 1992). Subspecies iliaca breeds west in Canada to the longitude of Minnesota, and winters with zaboria in the southeastern US. Thus, iliaca migrates southward and southeastward and would be expected to be less numerous in Nebraska than zaboria, likely significantly less. In addition, a perhaps sizeable number of intergrades might be expected to occur in at least eastern Nebraska. Field identification of the subspecies in Nebraska is very difficult, with only extremes of rufous and gray plumages possibly identifiable, as suggested by Beadle and Rising (2003). Probable examples of such extremes are grayish birds in Oct 1990 in Keith Co described as “belonging to one of the grayish western races” (Rosche 1994), one photographed in Dawes Co 13 Oct 2018 (Jorgensen, eBird.org), a bird suggestive of zaboria picked up in Dodge Co 7 Nov 2005 and sent to UNSM, now ZM18334 (cited above), and reddish birds that are good candidates for iliaca: the specimen cited above (Documentation) which is a fresh, very reddish bird, Fontenelle Forest, Sarpy Co 5 Mar 2017 (Peterson 2017), and 25 Mar 2017 Dodge Co (Croshaw 2017). The Rocky Mountain form, Slate-colored Fox Sparrow, P. i. schistacea, occurs rarely on the eastern Colorado plains, although there are recent reports as close to Nebraska as Washington and Yuma Cos, including excellent photographs of one in Washington Co 26-27 Mar 2016 (eBird.org, accessed October 2017). The other northeast Colorado records are of two in Oct and one each in Dec and Jan (eBird,org, accessed October 2017). The type specimen of schistacea was collected prior to 1858 about 25 miles east of the northeast corner of Colorado, apparently in Keith Co, Nebraska (AOU 1957). The only other claimed record of schistacea from Nebraska is of one reported in the Panhandle without details but by an experienced observer 1-2 Nov 2010. Changes since 2000: Even though numbers observed in winter are variable, reports have increased in recent years including numbers recorded on CBCs (Figure 1); prior to winter 2009-2010 there had been only about 25 reports for Feb, but since then such reports have been numerous. During the winter of 2014-2015 at least 16 individuals were at 11 locations in the southeast. 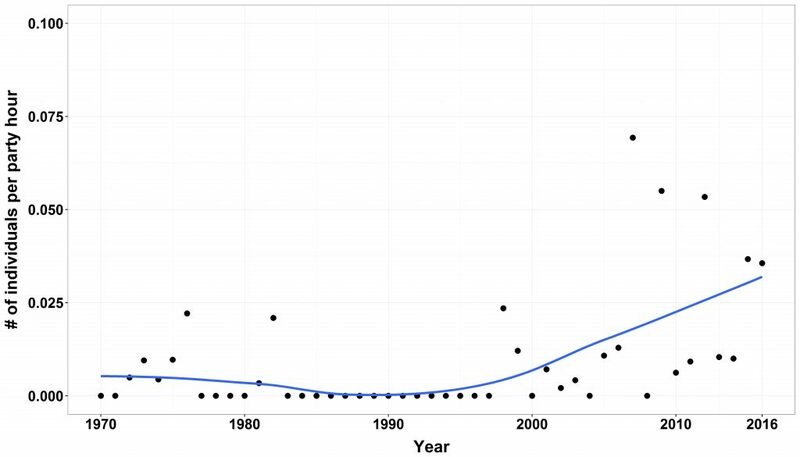 Figure 1: Number of Fox Sparrows detected per party hour on Nebraska Christmas Bird Counts during the period 1970-2016. Points represent reported values and trend line created using locally weighted scatterplot (LOESS) smoothing. Data collected by volunteers and provided by National Audubon Society and the Nebraska Ornithologists Union. Migration is from early Mar through early May; peak movement is in early Apr in the southeast, mid-Apr elsewhere. There are later dates 14 May 2008 Fontenelle Forest and 14 May 2005 Garfield Co. There is one documented Panhandle report, a single grayish Red Fox Sparrow photographed in Morrill Co 18 Apr 2014. On the eastern Colorado plains, Fox Sparrow was listed as a rare migrant by Andrews and Righter (1992) and in eastern Wyoming it is a rare migrant, “presumably iliaca/zaboria” (Faulkner 2010). High counts: 62 at Fontenelle Forest 1 Apr 2017, 25 there 5 Apr 2009, 23 there 29 Mar 2005, and 22 at Wood Duck WMA, Stanton Co 1 Apr 1998. Migration is from late Sep through late Nov, with peak numbers in late Oct-early Nov, although fall departure is protracted, especially in the southeast, where a few overwinter. There are earlier dates 5 Sep 1962 McPherson Co, 8-9 Sep 1972 McPherson Co, and 11 Sep 2010 Wind Springs Ranch, Sioux Co. Later dates include a number of CBC reports, with high counts of 19 on the DeSoto NWR CBC 29 Dec 2012, 17 on the Branched Oak Lake-Seward CBC 17 Dec 2009, and 13 there 15 Dec 2007. In 2015, a total of 21 were reported on CBCs, all in the southeast, including nine on the Branched Oak Lake-Seward CBC 20 Dec 2015. There are several Jan reports. Fox Sparrow is rare in the Panhandle, with reports 11 Sep 2010 Sioux Co, 20 Sep-4 Oct 1986 Sioux Co, 27 Sep 2016 Dawes Co, 29 Sep 2012 Sioux Co, 8 Oct 1977 Scotts Bluff Co, 13 Oct 1979 Scotts Bluff Co, 13 Oct 2018 Dawes Co, 14 Oct 1977 Sioux Co, 23 Oct and 2 Nov 1979 Garden Co (Williams 1980) and 8 Nov 2015 Kimball Co. It was reported during the CBC period at Scottsbluff in Dec 1971. Reports from the west-central, where the species is less than annual, are 16 Oct 2012 Lincoln Co (reported as “Red”) and 29 Oct 2015 two at Wood Lake, Cherry Co.
High counts: 32 at Boyer Chute NWR, Washington Co 18 Oct 1998, 18 at Wood Duck WMA 28 Oct 1997, and 15 at Fontenelle Forest 2 Nov 2016. Winter: Prior to the winter of 2009-2010, there had been only about 25 reports in Feb, indicating that overwintering was less than annual. Since then, however, this species has wintered in the southeast in good numbers. In 2013-2014 there were 12-13 birds reported at five locations through 22 Feb, and in 2014-2015 at least 16 individuals were at 11 locations in the southeast. Continuing the trend, in winter 2017-2018 there were an amazing 34 individuals reported Jan-Feb.
Beadle D., and J. Rising. 2003. Sparrows of the United States and Canada. The Photographic Guide. Princeton University Press, Princeton, New Jersey, USA. Croshaw, C. 2017. Checklist S35425193: 1435 N Union St, Dodge County, Nebraska, US. eBird.org, accessed 21 Jun 2018. Peterson, B. 2017. Checklist S34987164: Fontenelle Forest–Wetlands, Sarpy County, Nebraska, US. eBird.org, accessed 21 Jun 2018. Weckstein, J.D., D.E. Kroodsma, and R.C. Faucett (2002). Fox Sparrow (Passerella iliaca), version 2.0. In The Birds of North America (A. F. Poole and F. B. Gill, Editors). Cornell Lab of Ornithology, Ithaca, New York, USA. https://doi.org/10.2173/bna.715.